With summer just around the corner, I like to think of food that can be made well ahead and tastes great served cold, or at least cool, to keep me out of a hot kitchen. The vegetable part of this is usually taken care of with seasonal vegetable salads and the like. If the protein part means meat, I like to have pre-cooked pieces tucked away in the freezer. 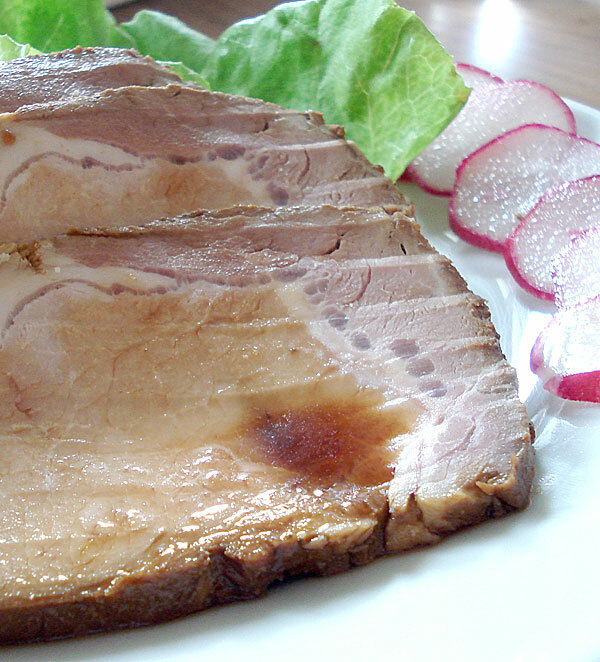 One of my favorite cold meats is poached and marinated pork, or _nibuta_. (_Ni_ means to cook in liquid, and _buta_ is pig.) It's very easy to make, stores beautifully in the refrigerator for about a week or much longer in the freezer, and of course, tastes great - savory, slightly sweet, and very juicy. It can be sliced very thinly or julienned for one-dish meal salads or in sandwiches, or chopped up and added to stir-fries, wraps, and so on. 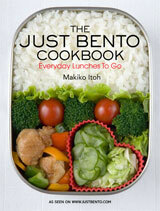 It's a great addition to a bento box. It can be cubed or coarsely ground and used instead of _char siu_ (roast pork) in steamed buns or bao. The possibilities are only limited by your imagination. There's one unusual 'secret' ingredient in the poaching liquid - one umeboshi or salt-cured plum. You can omit this if you like, but adding just one umeboshi seems to de-fat the meat a bit more than just poaching, plus making it taste a bit cleaner and fresher in an interesting way. An easy alternative to roast pork, this can be sliced and used for salads, stir-fries, as a cold appetizer or main dish, and more. It lasts in the refrigerator for a week, or can be frozen. It's best to make this with a cut of meat that isn't totally lean, so don't use an expensive cut like tenderloin or filet. It should have a little marbling, just like ham. Quite a lot of the fat will end up in the poaching liquid, which you can just throw out or skim off. 2 cup (880ml) regular dark soy sauce, Yamasa, Kikkoman, etc. If you want your pork to be nicely shaped, tie it up with the kitchen twine neatly. You don't have to do this if you can't be bothered. In the meantime, put the green onions or leek tops, ginger slices, and umeboshi in a pot with enough water to cover the pork. Bring to a boil, then put the meat in. Lower the heat until it's barely simmering, put on a lid, and poach for 90 minutes. Let cool a bit in the liquid. While the pork is cooking, combine the marinade ingredients - soy sauce, sugar, mirin and sake plus star anise - in a smaller pan and bring to the boil. Let cool. Put the marinade and the still warm, well drained pork into a plastic bag. Close tightly, and place in a bowl to catch any leaks. Let marinate, turning every so often, for about an hour or more. Store in the refrigerator until cold. The pork can be kept like this in the marinade in a tightly closed container in the refrigerator for up to a week. Or, take out of the marinade and store in the freezer (optionally cut into smaller pieces for easy use and defrosting). Best served cold and thinly sliced. The marinade itself can be defatted. Put it into the refrigerator until the fat has congealed, then strain) and used as a sauce, either on the meat or for other dishes. It keeps for about 2 weeks in the refrigerator. p>You could try to use the poaching liquid as a soup base, but I don't find the flavor that good somehow (the ginger and leek combo make it too strong) so I just throw it out. Defrost nibuta in the fridge overnight, rather than in the microwave which can dry it out. Submitted by maki on 2007-05-08 18:34. Yay! A new post. That sounds pretty good. I think I'll try it in a cold noodle soup. Might go well sliced thinly into ramen (the good stuff, not the brick-o-ramen junk). Mmmm, I must try this with the umeboshi! i rubbed the roast with sesame oil and seared it on the grill before poaching. (i used a george foreman grill as well, with good results). this gave a nice flavor element and cut the cooking time down to about 40 minutes. when the roast was done, i took it out, added some more water, and cooked pasta. you were right about it not making much of a broth, but as pasta water it was ok.
whole foods charges $13 for pickled plums. the local chinese grocery store charges $4.50 for them. i'm hooked on your website now. best website ever (after "icanhascheezburger" which is not about food. thank you for sharing your food with us!! I:ve read your site off and on for the year and a half I:ve been in Japan. It has been a big help or me in always trying to cook more Japanese food. What would you call this cut o meat in Japanese もも or ロース or something different? This would be ロース - 肩ロース　(shoulder) might be the best to use. which soy sauce do you use? chinese dark soy sauce? or japapese Kikkoman soy sauce? I use a Japanese brand of soy sauce, though not Kikkoman. Thanks very much for sharing this recipe. I found your site a few weeks back, and have tried a handful of the recipes, and all turned out well. I have a question on this recipe. Where I live, I could only get pork at the local supermarket, and they only sell those pre-pack cuts, and those are at most around 300gram each. If I use a smaller piece of pork, do I still poach it for 90 minutes, or do I reduce the time proportionally? Hi Ling, you should reduce the cooking time. You probably only need to cook it for around 30 to 40 minutes for 300 grams. Poke it in the middle with something sharp, and if the juices that run out are clear (not bloody), then it's done.